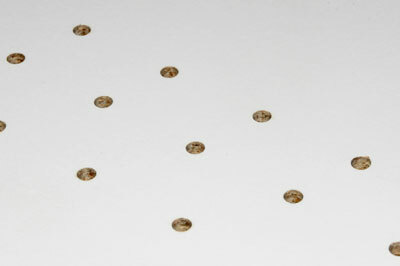 Drilling a series of holes in a straight line doesn't sound too difficult, until you have a go. As a one-off project you may be satisfied with accurate marking and using a drill stand or pillar drill and good results, albeit slow and tedious, can result. There are plenty of examples around of how to make a simple jig using a piece of ply or MDF where in conjunction with router fitted with guidebush, the process speeds up enormously but you still have the holes in the jig to cut accurately. 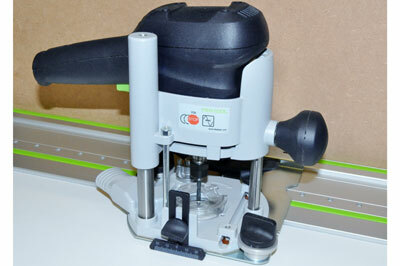 A number of manufacturers make adjustable jigs specifically for this purpose and the Festool LR 32-SYS is versatile with easily variable settings. This is not cheap at a RRP of over Â£400, nor is it simple to use - or at least not at first glance, but read later. 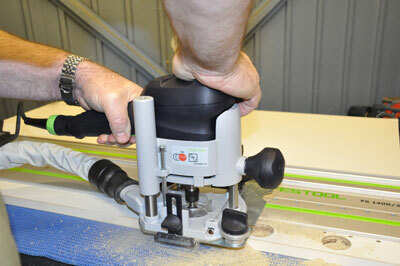 It is also a relatively well kept secret as trying to find it on the Festool website is almost impossible, but if you make cabinets, bookcases or any other items where accurate straight-line repeat hole drilling is required, this may be the tool for you. There are several versions of kit available and we are testing the complete one with everything included, except the guiderail. This is a standard guiderail as used with the TS55 plunge saw and routers but with the addition of a series of holes that form the stops for the LR 32-SYS; at Â£103.32 it makes the total system cost substantial. The good news is the guiderail also functions as the others in the range so could be your addition to an existing one for longer saw cuts. The kit itself comes in a Systainer with moulded internal tray, all to the high standard we expect. 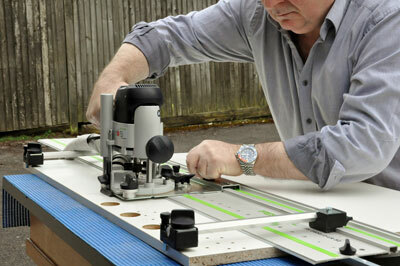 Supplied you have the main guide plate onto which the router fits and a centring mandrel to do this accurately. Three cutters are included: a 5mm flat bottom dowel drill for shelf fixings; a 5mm pointed dowel drill for fully penetrating timber with a clean entry and exit point and a 35mm hinge location cutter. 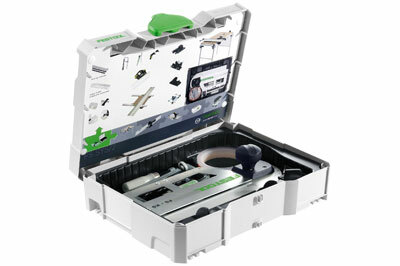 As with some other Festool products, a target user for this kit is probably kitchen makers and fitters. There are two stops, one for each end of the guiderail to set first hole position, two parallel side fences that determine the distance of drilled holes from your workpiece edge and two clamps to keep the guide rail securely in place - a slight disappointment with one of these was a lack of any 'dimple' stops to prevent the moving clamp head falling off the 'L' clamp bar. I have a few of these clamps and this is the only one to fall apart in this way plus it was twisted and overall not the same quality as the others. The guide plate is designed to work with two current routers in the Festool range - and older versions OF 900 and OF 1000 - but the OF 1010 is the one recommended and the one that uses the plate clamps for quick fixing. Use of my bigger brother OF 1400 necessitates fixing with screws into the router baseplate so is not so convenient. I did try my Trend T5 for size and I could possibly have also fitted this but only by drilling further holes in the guide plate and that might be a risky experiment. The OF 1010 comes with an 8mm collet, which is required for the three supplied cutters. Using the included centring mandrel the router was soon accurately in place. Either before or after this the guide plate location on the rail must be checked and adjusted by means of two screws to remove free play. There is a further initial setting to adjust for guide plate to rail play, shown in the user manual. It is worth taking time over these adjustments as they help understanding of how everything works and of course makes it more accurate and hence gives repeatable results on multiple workpieces. Both the parallel side fences must be adjusted to 'zero' once the router is fitted to the guide plate. Once done, these two fences allow spacing away from the workpiece edge to an accuracy of 0.1mm, thanks to an in-built Vernier scale. The fences feature the one element of design I would like to see changed, the small knobs that clamp the fence to the guiderail. Because of their position they are difficult to tighten and loosen and really do need to be extended to sit outside the edge of the rail - a potential easy future update. As an expected use would be with laminate in kitchen and similar cabinets, I decided to experiment and learn how to use the setup on a piece of not very good quality offcut. If it produced clean holes in this it should handle anything. It is important to practice and as written above, the combination of reasonable instructions, lots of parts and settings to get to grips with it appears complicated; practice and 'playing' with settings is vital. I soon realised it was far easier than I had thought and quickly understood how it all worked. 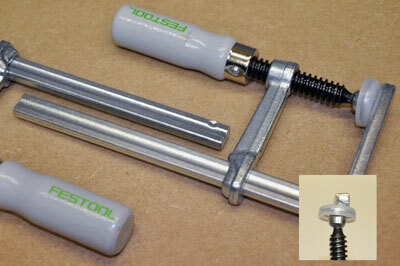 More detailed instructions are available on the Festool website. Spacing from the ends of panels is set using a bar at each end of the guiderail. This has markings which do take some effort to understand but eventually becomes clear and allows setting of 9.5mm, 16mm and 32mm spacing to the first hole. Using the latter two settings it is easy to drill a series of holes with spacing of 16mm rather than the industry standard of 32mm if you want more flexibility of shelf positioning. Eventually I resorted to using masking tape across the guiderail so it was very obvious not to move beyond that location. Drilling is straightforward, the router/guide plate moved until the locating pin drops into the respective hole in the guiderail. Using maximum speed setting, the resultant holes were very clean in this old, poor quality laminate unless trying to rush and use a too fast feed. To move to the next position, a large rocking lever is depressed to raise the pin, slide along the guiderail and the pin drops into the next position. Because of the orientation of the router fitted to the guide plate, I found on wider panels and working on the MFT table - featured in F&C 229 - it was easiest to work left-handed but with hands crossed, so I had left hand on the router pistol grip handle to operate the trigger and plunge, with my right hand around the front of the combination to hold the guide plate steadying knob plus operate the pin release - fiddly but workable. My version of the MFT has a top height of 980mm so taller than most workbenches and with a lower height working from the other side would be far easier. I did one series of holes working like this and, although a stretch, it wasn't difficult. For narrow panels and where you have more space for larger ones, working over the panel is more natural with your right hand on the router and left hand falling naturally onto the guide plate, assuming you are a right-handed user. The one disadvantage I found working with 'crossed' hands like this was a tendency to operate the router trigger lock almost every plunge - OK if you want the router to run during movement between locations, but not if you prefer a stationary cutter. 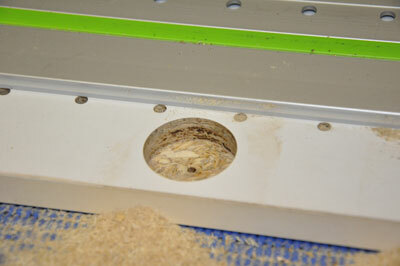 Overall, though I found using the OF 1010 router to be a delight and with the inbuilt extraction connection, I found almost all dust removed from the workpiece drilling the 5mm holes. 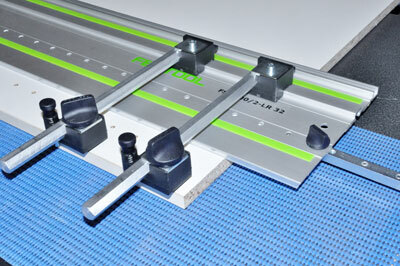 To finish testing I drilled a series of cabinet hinge location holes using the 35mm cutter. This requires the guiderail end stop to be changed to show 16mm spacing from the workpiece end and the fences to be reinstalled set at the appropriate distance. In my photo example, the distances from the edge are not correct - I was practising! 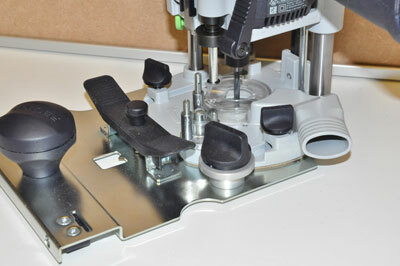 The cutter can run at up to 27,000rpm and once through the hard laminate surface, cut quickly to the pre-set depth. I did one hole in two stages removing the router between, as I know I occasionally fail to plunge to full depth and wanted to see if the hole was still clean edged. It certainly was with no evidence of having taken two bites at it, testament to the repeatability of the drilling jig. This is a high quality and supremely accurate system for drilling rows of pin holes in cabinets and shelf units and could be used for other purposes with a little thought, such as drilling decorative or ventilation holes in cabinets; with a little practice in a short time it becomes very easy to set up and use. It is probably only for those with a regular need as the cost is otherwise prohibitive, but if you already have the router and need a second guiderail for your plunge saw, it makes more financial sense and shopping around can result in substantial savings.